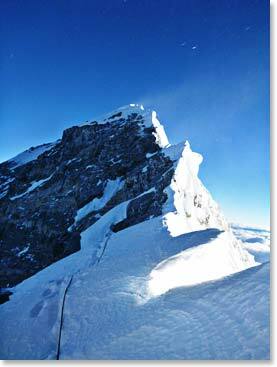 Join us in Bolivia from August 16 to September 3 for an awesome mountaineering challenge! 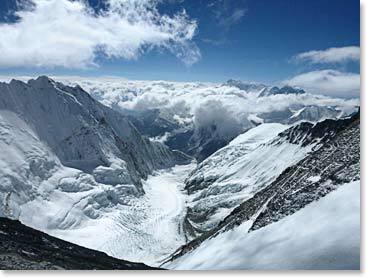 Whether Everest is an immediate goal or something far on the horizon, this trip will allow you to hone your skills and test your body’s ability to acclimatize in an effort to give you a taste of what Everest will be like. But you don’t need to be an Everest climber to join us. All are welcome. See the detailed itinerary here. Contact our office for details. Our 2013 Everest Expedition has come to an end. We once again want to congratulate our team members Steve Whittington, Todd Pendleton and Daniel Branham. These men were away from home for two months for this expedition, they were a great team throughout and the experiences we shared will live in our memories forever. 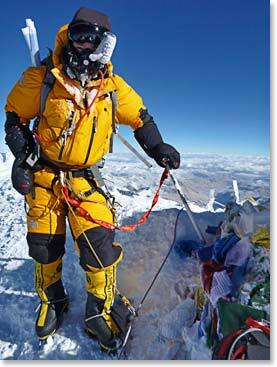 The organization of an Everest expedition involves the efforts of a lot of talented and hard working people. We want to thank everyone who helped to make this year’s expedition a success. 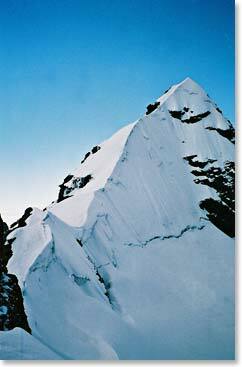 Interested in climbing Everest? 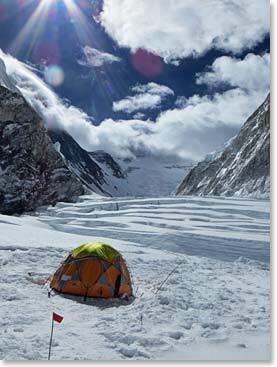 We’ve already begun planning Spring 2014 expedition – contact our office for details! Enjoy this awesome recap of the Everest summit day from Steve Whittington. Read the entire recap on his blog. Also, check out the trip dispatches for more photos and details from the expedition. It is Sunday May 26th as I write this. It has been nine days since 7:00 am May 17th when I stood on top of the world. It is a nice morning in Kathmandu. The sun is hidden by a grey featureless sky, but the air is warm and humid and my body after all these days still just wants to bathe in thick, moist air. There remain whispers of frost bite scabs on my face and my finger tips are numb, but that day seems so long ago. The first night at the col is lost to me. We tried to rest, we tried to talk but mostly we just lay there lost in our own thoughts, listening to the roar of the wind. We hydrated and waited for the warming sun. 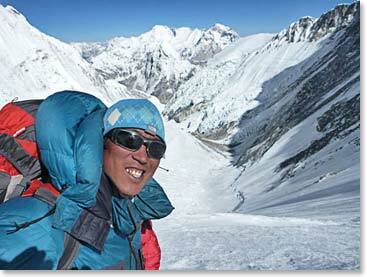 The next day passed quickly, we made our summit climb plan with Dawa the lead Sherpa. Daniel who had struggled between Camp III and IV was now ready to give the summit a go. Todd had been ready since the night before. I did not know. I had not been able to eat since Camp II. 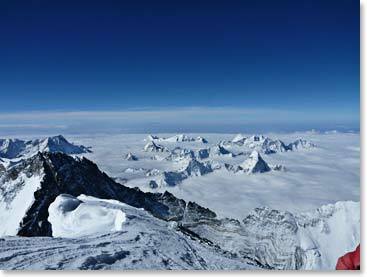 While I had rested for over 24 hours I knew having lost over 20 pounds to reach the South Col my reserves were growing thin…or not there at all. I never thought of not going and I was not worried about dying but I knew the risk was out there, between the South Col and the summit. 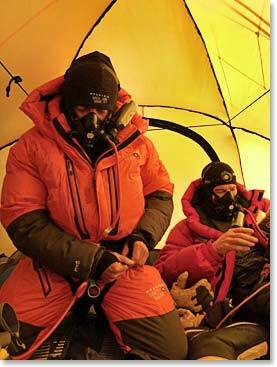 An hour prior to leaving we sat in our tent in a triangle facing each other with all our gear on. No one spoke, we were hollowed out, our faces were pale, grim but set with resolve. This was the final push. We sat and were rocked by the wind buffeting the tent until the final appointed departure time of 7:00 pm. I remember the motions, one step in front of another, the stunted vision in the darkness and the blowing snow; the continual struggle for air and energy with every action. At first Dawa led, but about an hour into the climb Tashi and Todd sped past us. I watched their lights grow distant up high above as the storm wrapped us in a tighter embrace. I kept checking Daniel’s progress and his light faded as well into the gloom. At times Dawa and I could see no lights, at times we were alone on the mountain. We had expected to be slow but we had not expected a storm. The weather was supposed to improve and the winds were forecast to drop. Now many hours later high on the mountain just below the Balcony I struggled to pick myself up. A powerful gust of wind had knocked Dawa and I flat. I pulled out my ice axe and switched to the lead. Rime ice coated us head to toe. The Balcony is an aptly named flat spot on the route. Sometimes a turn around point depending on how you are feeling. If it has taken everything you got just to reach here, the rule is turn around. Teams stop, hydrate, change oxygen bottles and access whether to continue or not. Dawa and I had struggled hard just to get here. The storm did not seem to be going away or getting better. I thought for sure I had sucked back too much O2 but surprisingly I had a fair bit left. I pulled my nalgene bottle out of my suit, lifted my mask and gulped down some hot orange. The ridge is not very steep at this point so I walked forward along it, planting my axe and breaking trail in the fresh snow. Dawa pulled the line and I continued to slide my useless ascender along it subconsciously…and then it hit me. I got mad. After 56 days on this mountain I was not going to let a storm turn me around. I was breathing well, moving well and I was firmly planting my axe in every step. At this point I knew Daniel and a lot of teams had turned around, I also knew I now wanted carry the torch and summit for Daniel. I wanted to summit from my friend Warren Thompson. I knew my wife believed in me. This wasn’t just about me anymore, I now climbed with renewed strength for them. Energy surged through me as I pushed back against the wind and climbed up the steeping ridge. It did not take long for Dawa and I to reach Tashi and Todd. I asked Todd what was going on. He did not really know what to say other than Tashi thinks it is too dangerous. It was dangerous, with the storm blowing visibility was low and with everyone turning around you begin to question why you are still climbing. I kept looking ahead into the darkness. Todd asked how my eyes were. I said “fine”…”it is bad up ahead” he commented. We stood there for a few minutes, over the storm we did not really discuss anything. No one talked or wanted to make a decision. Another team came up behind us. Dawa talked to their lead Sherpa. Everyone stood still. I turned and yelled over the wind to Dawa ”We can still turn around ahead?” an unfinished what if scenario question. He understood “Ya”…”Well let’s go” I finished. While the final sections are considered the most technical, I traversed the corniced ridge line and stemmed up the Hillary Step quickly. Soon it was a victory march on the last broad ridge to the prayer flag adorned summit. Every step was emotional and purposeful. They will stay with me forever. I reached the summit and stared at the world below. It was clear, it was bright, it was beautiful. I burned the moment into my soul. While tiring, the way down was uneventful. I took my time and rappelled where I needed to. The weather had cleared and the day had turned out to be a perfect summit day. I stopped at the balcony, it was out of the wind so I did a dispatch call dedicating the summit success to my friend Warren Thompson. 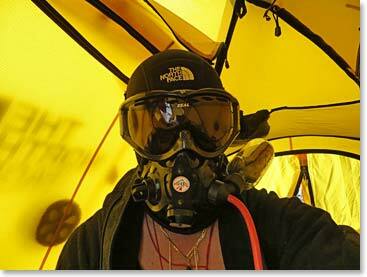 I still had a way to go to the South Col, but I knew another mask and more oxygen was waiting for me down there. 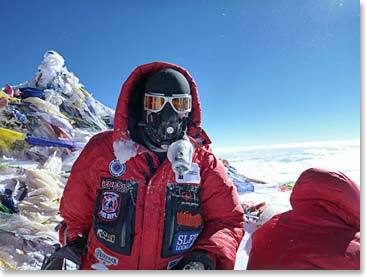 When I reached the South Col I was quite hypoxic. I could not find the spare mask or additional oxygen. I admit for a while I grew quite frantic and only after finding them and a sat phone call to Wally Berg our expedition leader at base camp did I begin to settle down. Todd made it down shortly after I did. We were both exhausted and had frostbite on our faces which were also swollen from the beating the wind had handed out. Todd had also incurred frost bite on a finger and several toes. The summit had taken it’s toll. Considering the shape we were in we decided we needed to rest the night before heading down. The next day I reached Camp II and the day after base camp. After 58 days the climb was over. I could go home.